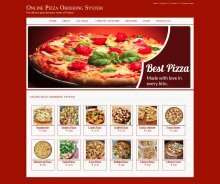 This project Online Pizza Ordering System has been developed on PHP and MySQL. Many php online projects are available in our site Freeprojectz.com. The main objective for developing this project was to sell Pizza online order. This project Intends different types of forms with different test of pizza varities provides to user to buy online. Online Pizza Ordering System Project in PHP Users can give order from any place and pay cash on delivery. This project provides a lot of features to manage in very well manner. In current system, we have integrated a single payment system Cash on delivery but in future we will enhance it with online payment system. When an order has been confirmed by a customer order processing begins. Throughout the order processing the order status will be updated and the customer will be notified. New orders will show up in a list for the employees in the kitchen. This application has a good appearance and is very easy to operate. It is very simple and easy to access at PHP. It is a very simple source code. It saves our time. This project provides a lot of features to manage in very well manner. This project contains a lot of advance modules which makes the back end system very powerful.